The Indian agriculture state of Punjab has been making rounds in the media, for installing world’s largest rooftop solar power plant as per the Punjab Government. With this Punjab will now produce 470MW of renewable energy, from just 9MW in 2012 – more than 50 times increase in four years-time. This project will generate energy to power more than 8000 homes. This 11.5 MW solar energy plant costing INR 139 crores, has the capacity to 27 million units of electricity annually. It is estimated that this plant will forego 19 thousand tonnes of carbon dioxide in the next 25 years-time. A PPA has been signed between Punjab State Power Corporation Limited (PSPCL) and the developers for 25 years. It is spread across 8 rooftops over more than 80 acres of land. The EPC contractors for the project were Tata Power and Larsen and Toubro. In addition to this 11.5MW plant, seven rooftop solar power plants of 8Mw capacity were also inaugurated in the premises. Read more about Tata Power panels here. Note Punjab was amongst the best performing states for solar energy capacity addition, and was recognised by the Indian PM during Re-Invest in 2015. The state currently has a project pipeline of 500MW. However the state came up with a scheme to buy solar power from the farmers that failed to take off, obviously because a farmer would not be able to come up with the equity capital for a INR 6-7 crore project. However this rooftop project is really laudable, also owing to the fact that land in Punjab is pretty expensive. 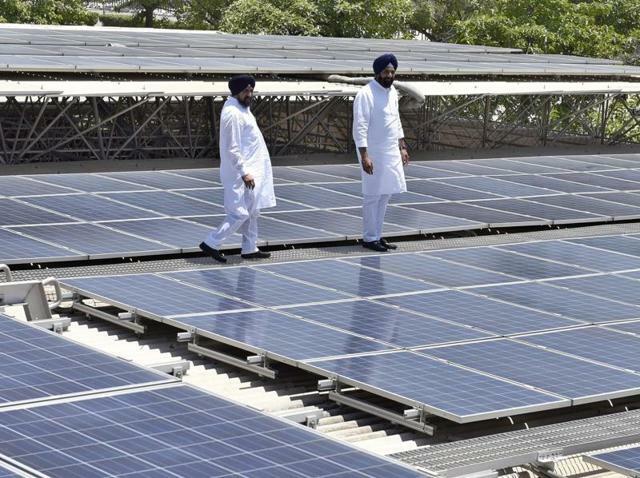 The new and renewable energy resource minister Bikram Majithia said Punjab would achieve a target of more than 2550 MW of renewable energy generation by 2022. India has plans to generate more than 40,000 MW of renewable energy power by 2022. This was a big step by the state to energize the solar revolution in India. The investment in this sector has increased by more than 120 times to Rs 10,000 crore now, from Rs 82 crore in 2012. The employment opportunity has also gone up to 12,500 jobs.